While the regular bulk uploading of files comes with ease and automation to smartphones, the idea of choosing and offloading individual files comes with some difficulty. That's where designer Ishac Bertran's intuitive UI concept comes in: making use of spatially-aware hardware. Simply put your device next to the laptop screen, and it's presence is recognised via a formed circlular moon-like image from both sides. 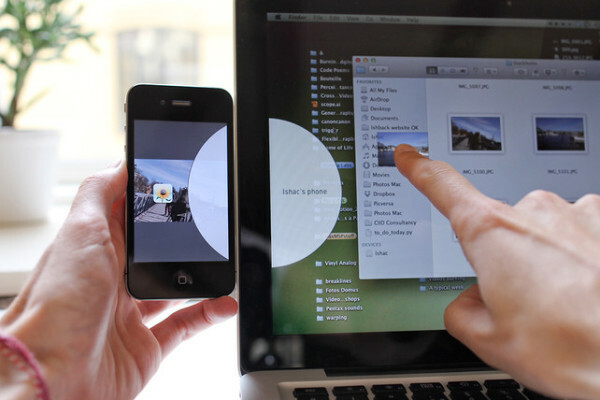 You then tap and drag files or folders you'd want into the circle to sync with the smartphone. Of course, the manual aspect to this doesn't translate well to the mass offloading of files, as your arm would probably ache before long doing this. But aside from that, it's a simple concept done rather elegantly, providing a rather unique take on what has usually been a click-and-drag affair previously.